You’ve had your well tested and learned there are a number of contaminants in your water. 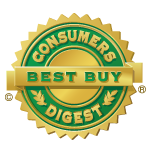 You want to do everything you can to protect your home and family, but you’re not sure which water treatment system is best for you. Today, many New Hampshire homeowners are using whole house reverse osmosis systems to treat their well water. How does a whole house RO system work and is it the right solution for your drinking water problem? As its name implies, a whole house reverse osmosis system treats all of the water you use throughout your home—from the kitchen, to the bathroom, to the laundry room. It is also called a point-of-entry system because it is installed at your main water line (where water first enters your home). It is a much larger version of the small under sink systems we offer to mostof our residential clients. This type of filtration system can be configured to remove odors, chlorine, and other contaminants, producing water suitable for general everyday use. “We use whole house RO systems in situations where a homeowner’s water has so much damaging mineral content that normal filtration methods are not sufficient, explains Nate Clark, certified water specialist at Secondwind Water Systems. “This technology is commonly used for salted wells—those that either have a high level of road salt in them or have been impacted by coastal seawater intrusion,” he adds. Whole house reverse osmosis systems remove up to 99% of common contaminants, including total dissolved solids (TDS), which can be made up of sodium chloride, arsenic, nitrate, sulfur, and other chemical and naturally-occurring contaminants. Left untreated, excessive contaminant levels can affect the taste of your drinking water and cause damage to your plumbing, fixtures, and water-using appliances. It can also cause spotting on your dishes and staining to your clothes and anything else you run through your washing machine. With a whole house RO system, oftentimes the raw water requires pretreatment with a softener or large backwashing sediment filter to prevent scaling or clogging of the membranes that perform the reverse osmosis. Large amounts of water are treated and kept in storage tanks. Using a pump, this treated water is re-pressurized and distributed throughout the entire home. “We’ve had tremendous success with our whole house reverse osmosis systems,” Nate notes. He recalls a system he helped install in Derry, New Hampshire. “The well contained high dissolved solids and chlorides due to road salt runoff into the well or aquifer.” The home was located between traffic-heavy Route 102 and Beaver Lake—leaving no room to drill another well. “Even if there was space to drill another well, there were no guarantees about the quality of available water,” Clark points out. “We already had a softener there for hardness, iron and manganese, and two types of sediment filters for turbidity and particulates. But the chlorides in the water were corroding their plumbing and fixtures throughout the home, and reverse osmosis was the only effective means of substantially reducing them,” Clark explains. 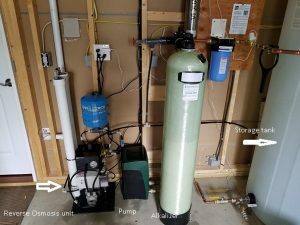 After installing their whole house RO system, the total dissolved solids (TDS) reading on their household water dropped from 1,100 ppm to 40, with no chloride residual. When configuring a whole house RO system, there are many things to consider. One of them is bacteria. A whole house RO requires a storage tank to provide enough water for the home at all times. Water may sit in that tank for some time, so part of the entire installation may include an ultra violet system which gets rid of any unhealthy bacteria. This keeps your water clean and safe. For many homeowners with private wells, a whole house reverse osmosis system provides the most cost-effective, highest quality water. To determine if this is the right system for you, contact the water treatment experts at Secondwind Water Systems. 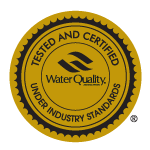 We’re New Hampshire’s leading provider of residential and commercial water treatment systems.